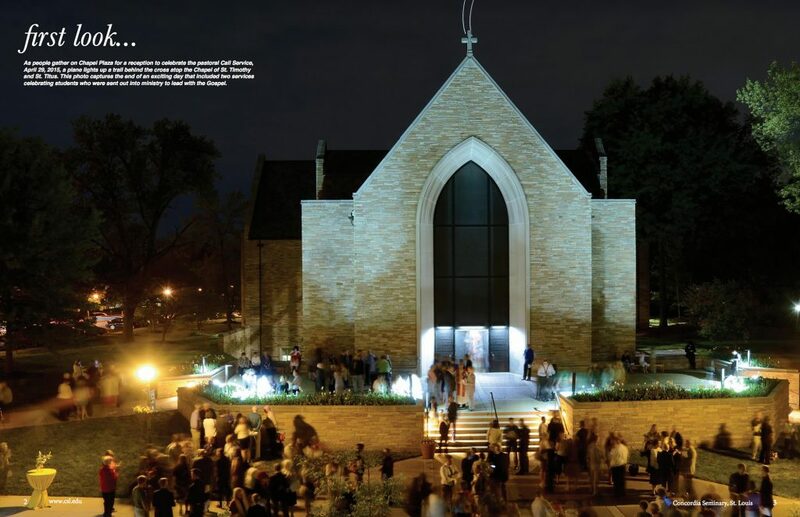 I just recently discovered that one of my photographs that I captured during my time at Concordia Seminary, St. Louis was entered in the “Best of Church Press” Awards for 2016. Back in April of 2016 the winners were announced and I received the honor of Award of Excellence in the category of “PHOTOGRAPHY: Photo Spread w/Article or Cutline: Magazine/Journal” for one of my photographs that appeared in the Summer 2015 issue of Concordia Seminary Magazine Summer 2015 edition, accompanied with Michelle Meier, designer and Jayna Rollings, art director. Each year, the Associated Church Press honors faith communicators’ best work with the “Best of the Church Press” awards. New and established newspapers, newsletters, magazines, journals, news services, E-zines, bloggers and websites earn kudos, as do the many excellent entries in social media and video. This year’s winners were announced at the annual Awards Banquet at the April 2016 convention in St. Louis. I have had the honor and privilege to be published in the Edwardsville Intelligencer newspaper on several occasions for my photojournalism work. However, to receive an “Award of Excellence” from such a prestigious and long standing professional organization as the Associated Church Press is truly a high honor I greatly appreciate.